Finally, the time has come. We, the 8th Grade Class of 2018 at All Saints Academy, the first class to go through Pre- K- 8th grade, pass over our student leadership of All Saints Academy, to our future leaders, the 7th grade. The student leaders to this school. Our school. Your school. We now pass over the leadership to you because we are ready to go on the the next level. High school. We have completed 8th grade, and you will too. But it isn’t always easy, and I’m sure I can speak for everyone in this class when I say this. It is hard to be a leader. It really is, sometimes. Sometimes you inhibit yourself from your homework, or school work, because you feel it’s just too hard. That is just one simple example of something that can prevent you from showing leadership. Showing examples of our core values, Faith, Learning, Loving, and Serving can be stressful at times. However, in a few minutes we will pass our candles on to you, signifying your turn to lead. We have faith in you. We know you will be good leaders, and will do well your last year here. We wish you luck on this journey. This isn't going to happen overnight, you know. This is a process. I’m still progressing in my leadership skills. We all are. Every single last one of us. So, while on this great, challenging, exciting journey you all are about to have together, remember to pray with and encourage each other. We offer our deepest prayers, support, and encouragement to all of you. Good Luck! And of course, we’d like to say thank you and goodbye. To our priests we’d like to say thank you for your continuous love, support, guidance, and friendship. Thanks also to our teachers and staff for your love, support, knowledge, and the pride you take in teaching us and wanting us to be successful and do great things in our futures. Finally, we are thankful for each other. For our love for our classmates. As we say goodbye to you all, we also say goodbye to each other as we leave for different high schools. Of course this is a hard thing, and you will experience it too, but the Holy Spirit will bring us back together someday. After all that, I’d really like to leave you all with this: All leaders have one good quality and it’s the ability and willingness to work with others. 7th grade, your willingness to be in this together, as one, is critical. Just think about that. I know my willingness to work with those around me to become a better version of myself, not only as a leader, but as a person has helped me grow immensely.. (small pause) Perhaps that might mean that you range out of your comfort zone, a bit. And that’s up to you as to what that means for you next year. I did that, and it benefited me greatly. This past year, I stepped out of my comfort zone and it made this year amazing for me. In Jesus’s love, until He comes, may God be with you all. Congratulations to our ASA Alumni High School Graduates! This past week the 2018 Senior Classes of Catholic Central and West Catholic graduated. Among them were a number of All Saints Academy Alumni. A special All Saints Academy congratulations to all our Senior Alumni this year! We are so proud of all of you! As a graduate of ASA we are confident that you will continue to learn, love all, develop your faith, and serve God! We would also like to extend extra congratulations to the following award recipients! Thanks to all who were able to join us on April 30th for the Protecting Young Eyes presentation with Chris McKenna. 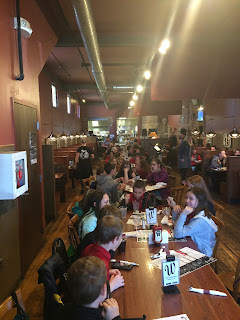 We had a great turnout! 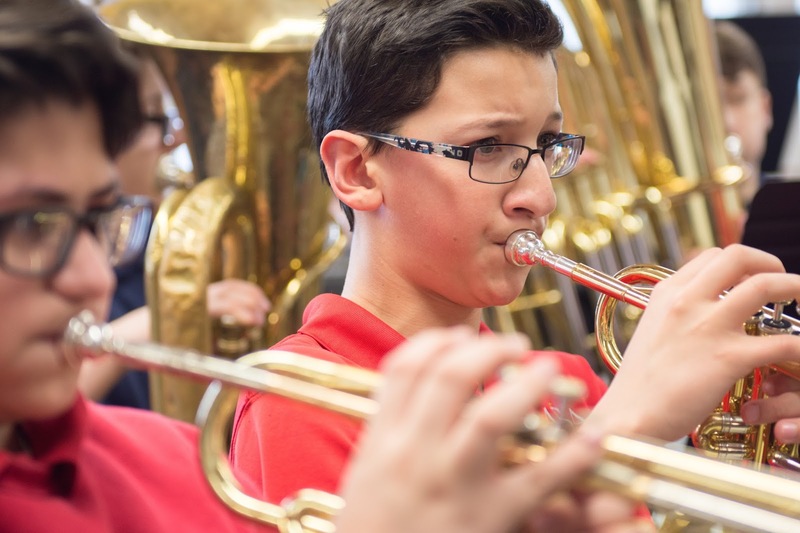 Interested in more parent information nights? Save the date for an adolescent focus session with Sr. Colleen Ann Nagle! Students and teachers will be continuing to incorporate the Virtue in Media curriculum from Protecting Young Eyes this May and throughout the 2018-2019 school year! Cell Phones - If students have personal devices like cell phones at school we request that they remain off and in lockers during the school day. Any technology access students need for learning is available to them through school devices and their ASA Google Accounts. Communications between home and students can still be easily coordinated through the school office. Look for follow up blurbs in Friday emails blasts AND additional parent info night topics for the 2018-2019 school year. At ASA We believe that We Are One community working together to Form Saints to Serve All. Our mission is to serve and partner with our families, parishes and communities as we focus on the spiritual, intellectual, moral, social and physical development of our children. The All Saints Academy 6th graders recently went on a field trip to Urban Roots farm where they were able to put all four of our core values to action: faith, learning, loving, and serving. They experienced faith and serving through caring for God’s creation in the service work they did on the farm. They helped clean garden beds to prepare them to be planted, they cleaned up garbage that had collected from the winter, and they helped spread wood chips. They learned about how the community garden works, and they also learned about the planting season we have in West Michigan, which fruits and vegetables can be planted when. They loved their time at Urban Roots, and they very much loved and enjoyed the family style lunch they shared: macaroni and cheese with a carrot based cheese sauce, with a side of greens. The 6th graders reflected on their experience and shared their thoughts below. "My experience was fun and seeing what happens on a farm is amazing I think my favorite part was the mac and cheese that we ate. It had a farm fresh twist that was amazing. They also have a volunteer program. And I might just do that." "My experience was awesome because we got see all sorts of different plants and seeds. We had a lot of fun spreading wood chips around and picked weeds in the garden. These were only some of my favorite things we did." "I think our experience was good for our class. We got a taste of the farm life, and it tasted sweet." "It was amazing! First we got a tour of the farm, and it was very interesting. The farm and the house were very homey and the workers were very welcoming. The lunch was spot on; Mac and Cheese! ; )"
All of the students who went recommend you go and volunteer there to help out. Mrs. Megan Schneider was surprised last month with a special recognition. 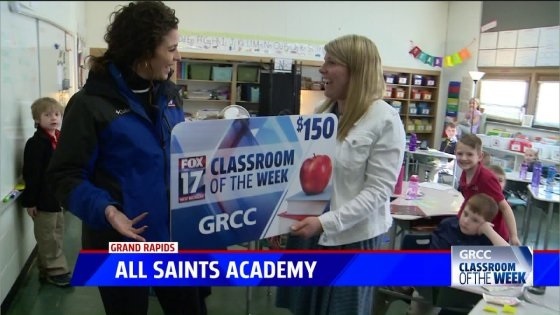 Fox 17 and Grand Rapids Community College presented her with the "Classroom of the Week" award. She and her students were truly surprised! Mrs. Schneider also received a $150 gift card to staples so that she could provide some extra resources and supplies for her first grade students. Mrs. Schneider has been with All Saints Academy since the very beginning and spent time teaching at St. Isidore before that. You can see the full video here. On Thursday, April 26th, the All Saints Middle School Jazz Band went to Hastings to participate in the Thornapple Arts Council Jazz Festival. The jazz band meets after school once a week for an hour on Wednesdays, and is made up of thirty students in grades 6-8 from ASA as well as seven students from St. Patrick Parnell and Divine Providence Academy. They played the jazz standard Bill Bailey, Henry Mancini's The Pink Panther and a tune in a rock style called Tyrannosaurus Charlie which included several improvised solos. 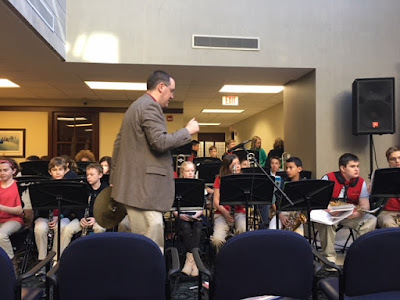 After performing, the band had a great clinic from expert jazz musician and teacher Greg Wells who complimented the band on the many good things they were doing, and challenged them to continue to grow by highlighting areas for continued improvement. 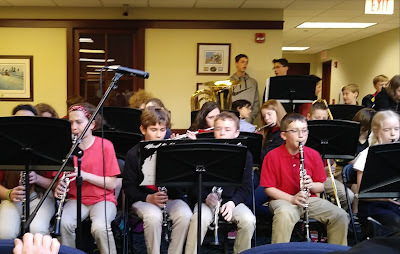 After the clinic on their concert music, the band got to listen to two high school school jazz bands play in a nice outdoor band shell (the weather was perfect) before going to eat at the Waldorf Bistro. A professional jazz combo, made up of a vocalist, drums, piano, and bass played throughout lunch. Several students commented that it was the best meal they had ever had. The food was very good but the music made it even better. Finally, the band went to a small coffee shop and ice cream house where everyone was able to get a treat before returning to ASA. The day was a perfect combination of learning and fun. 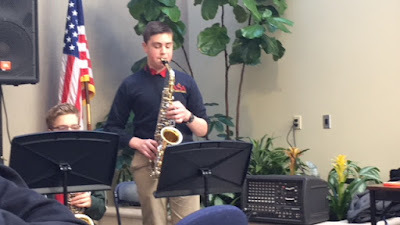 ASA 8th grader Aiden McGavin will return later this weekend to participate in the Middle School All Star Jazz Band, a select group of nominated players from many area schools.